In the Neatopricer application hit your "Menu" key usually represented by 3 or 4 horizontal lines. 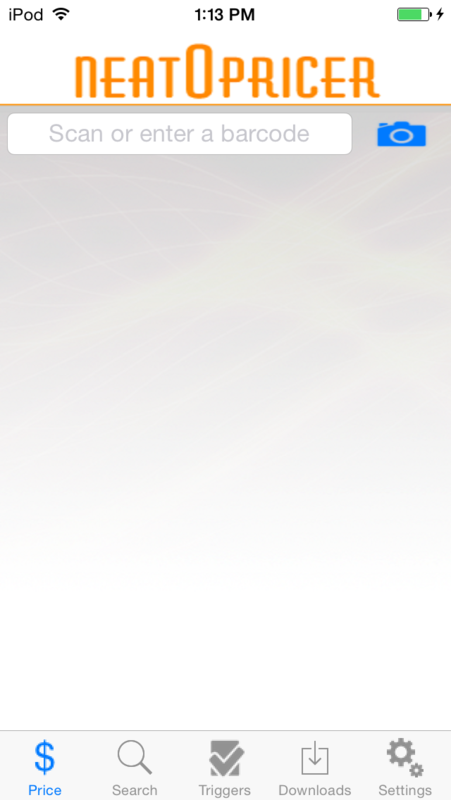 This will bring the main menu of our application. Select the option "Triggers" to begin building your parameters. Selecting "Triggers" bring up a screen with a bunch of catalogs. 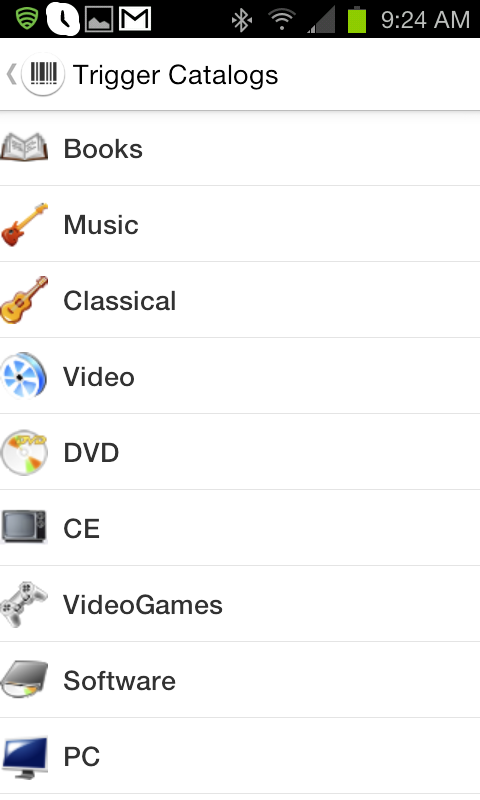 Triggers are per catalog so if you create a trigger for books it won't be present for music as well. Select your catalog. In this example, we chose books. You will see this is where you can specify your criteria. 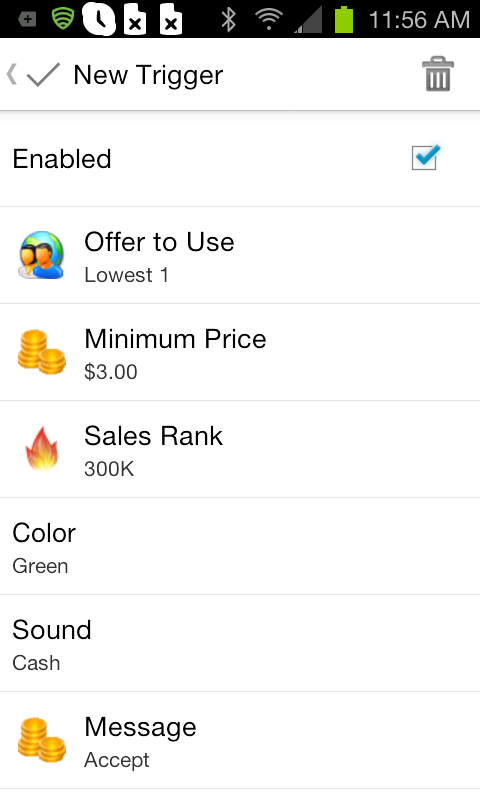 Here you can specify the minimum price, maximum sales rank, color of bar to show when hit, message like "BUY!" 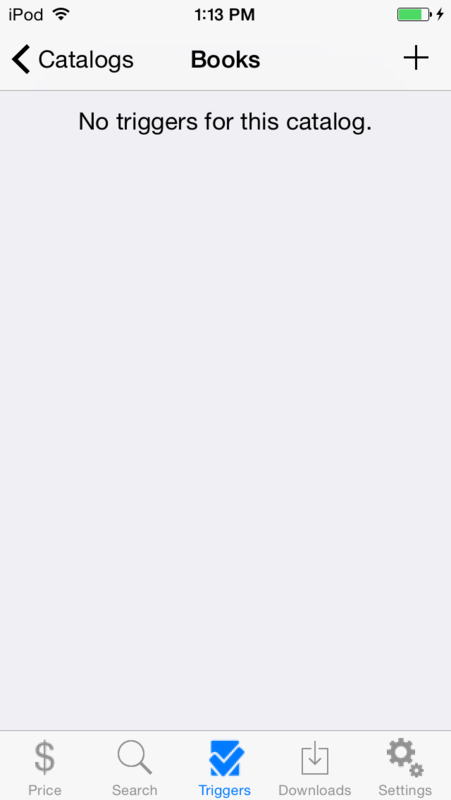 or the default "Accept", and which offer to use like the lowest. 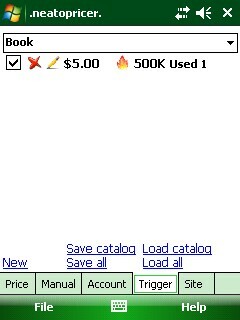 When done hit the check mark in the top left corner and you will now see your trigger listed under "Books". 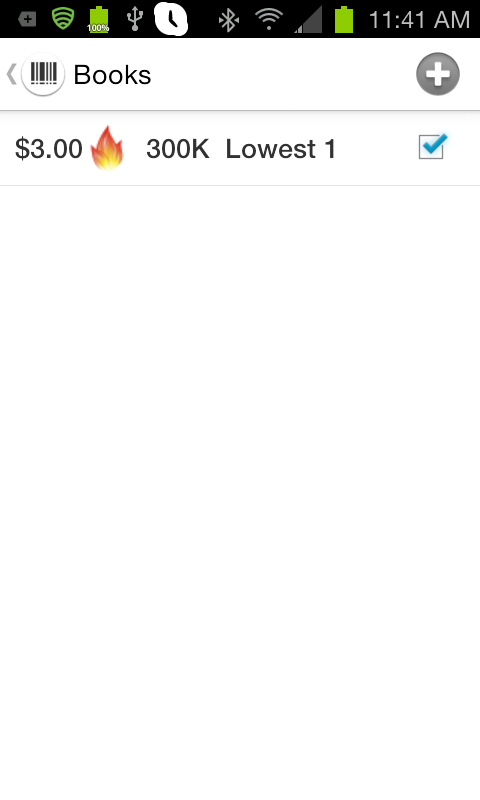 Hit the + sign in the top right corner to begin. You will see this is where you can specify your criteria. 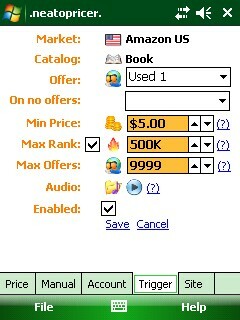 Here you can specify the minimum price, maximum sales rank, and which offer to use like the lowest. When done hit the save button and you will now see your trigger listed. If you would like to delete a trigger, go back into your trigger and select the delete button. In the Windows Mobile version of Neatopricer(Version 4) the triggers look a bit different. This is a comprehensive guide to show you how to make, edit, and delete a trigger among various other helpful hints. The new trigger screen when you first launch your Neatopricer 4.0 on Windows Mobile looks like the image below. In order to create a new trigger you need press the New button at the bottom left corner pictured below and indicated by the red arrow in Figure 1.1. When you hit the New button you will see a different screen come up pictured in Figure 1.2. This is the screen where you can configure a trigger. As you can see there are a number of options on this screen. 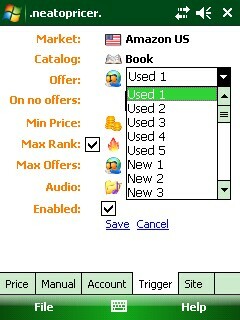 It shows you the Market, catalog, offer, minimum price, maximum rank, maximum offers and audio. But what does all of this mean? The newest feature in the triggers is the ability to save your triggers for back up purposes. If you hit "Save catalog" this saves your triggers to a fille but only the catalog you are in, for example, book. If you hit "Save All" this saves your triggers from ALL catalogs. If you ever need to reload your triggers from the back up file created when you saved, you can hit "Load catalog" and this will load the file you saved with "Save Catalog". If you hit "Load all", this loads the "Save All" file you saved previously. This is handy if you have a lot of triggers and want to back them up so in case you ever need to re-register you won't have to take the time to set them all backup. 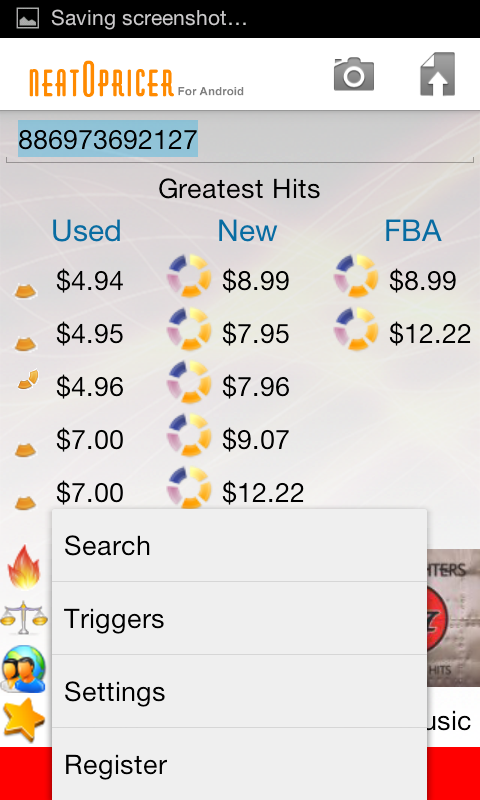 The new triggers are more customizable and allow you to have triggers based on Used, FBA, New, Featured and more. 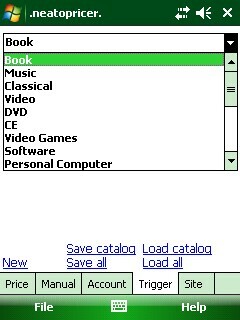 An example of this is shown in Figure 1.3, you can access this menu by hitting the drop down arrow. By choosing Used 1 all parameters set will be tested against the first used offer. 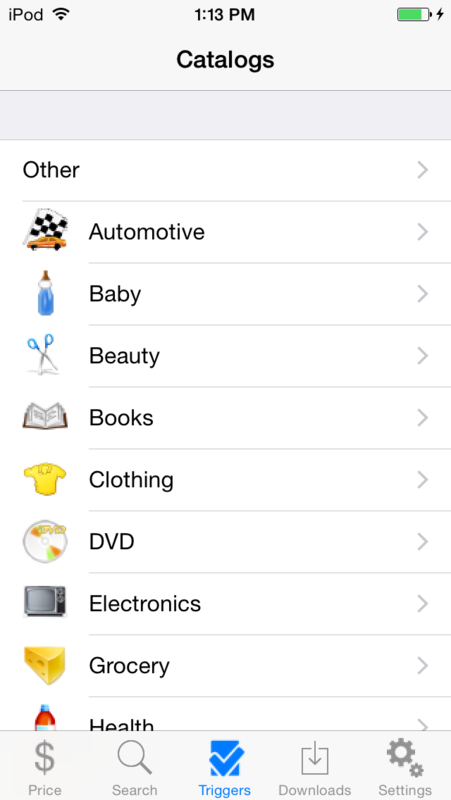 The ability to choose anything but used in the previous version of Neatopricer was not an option. If you want to choose a different product category you can do so by hitting the drop down arrow on the main trigger screen. There are many product categories to choose from as seen in Figure 1.4. It is important to note that Used 1-5 does not refer to the maximum AMOUNT of triggers you can have for USED. USED 1 means it will test your chosen parameters i.e. 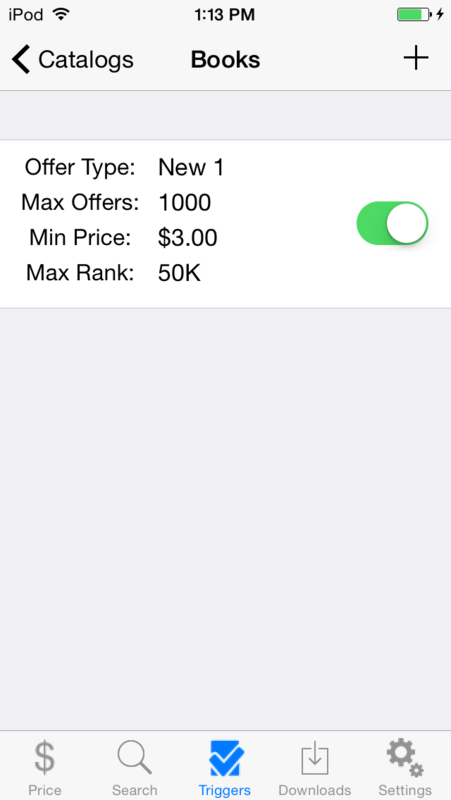 $5.00 and 100k rank and test it against the FIRST LOWEST offer. This is true for all other offers listed in the drop down box i.e. New 1 means first lowest new offer. Once inside of the trigger screen you can set your parameters. Most of these are user preference and can be set based on what you feel is an appropriate trigger. For example, if you want a trigger to alert you when you come across a book that $5.00 and up and has a sales rank of less than 100k, you can set this up by creating a new trigger. 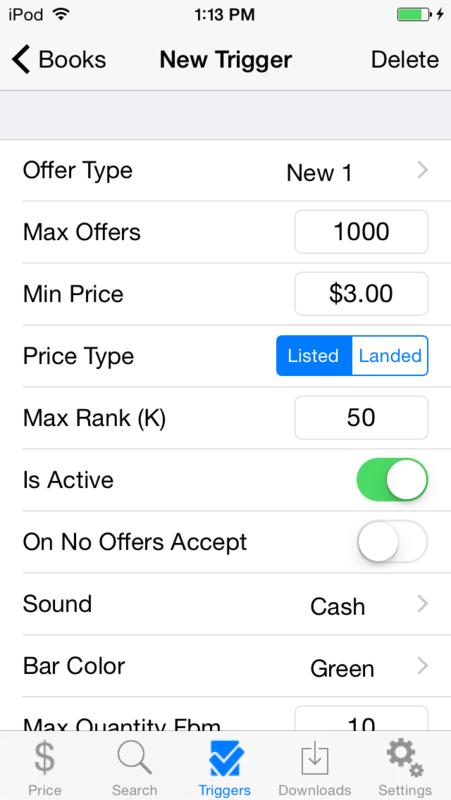 Shown below in Figure 1.5 is an example of setting up a trigger for the following parameteres: Min Price: $5.00 Max Rank: 100k Based on the first lowest offer: Used 1. Once you create a new trigger, you want to click the Save button. After you select your Save button, it will put you back to the main trigger screen however, now you will see the trigger you created shown below in Figure 1.6. To 'Delete' your created trigger, you hit the Red X shown in Figure 1.7. To 'Edit' your trigger, you select the 'Pencil' icon shown in Figure 1.8.